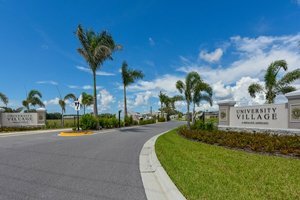 University Village is a gated community consisting of some 200 courtyard and patio villas located off north of Tallevast Road just two blocks east of U.S. 301, a thoroughfare vital to the values of many Bradenton and Sarasota homes for sale. This community sits on a 51-acre site which is also a short distance from the University Parkway corridor running east‒west south of the property. Its developer, Bradenton-based Medallion Home, started building here in 2016 as part of the construction boom that ensued in the Southwest Florida area following the U.S. recovery from the Great Recession. Medallion planned University Village as a gated, maintenance-included community but with no CDD fees charged to its residents. Set for completion in four phases, the Village extends its name’s association with an academe in the neighborhoods’ various street addresses, such as Registrar Way, Trustee Avenue and Alumni Trail. Such a serious, scholarly image, however, is effectively balanced by the vacation-like living which is also a dominant theme in the development of University Village. There are various amenities in this community which fosters a relaxed lifestyle. Besides an electronic gate entry, the come-ons to prospective buyers of University Village homes for sale include a clubhouse, swimming pool and spa, and a dog park. The resort-like ambience within the community gets some more lift from the paired villas at University Village. The home designs that Medallion has made available for this community are all named after some of the region’s touristy barrier islands, including Siesta, Lido, Anna Maria and Casey. Choices on University Village homes for sale are priced from the $200s up to the $400s, flaunting the endearing Southwest Florida architectural style and flanked by lush greeneries and lagoons. 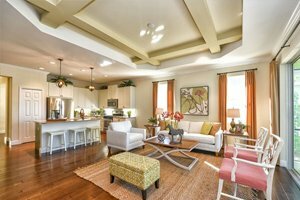 The villas’ floor areas range between 1,400 and 1,650 square feet with designs standard at two bedrooms and two baths plus a two-car garage. Brick pavers and tile roofs are likewise common features in these charming villas which had its Casey model showcased in the 2017 Manatee Sarasota Parade of Homes. University Village’s central location puts its residence just minutes away from Sarasota’s prime attractions. Shops and restaurants abound just south of Tallevast Road at University Walk on the corner of Lockwood Ridge Road and University Parkway. A bit farther east, the Mall at the University Town Center offers an even wider field of life and leisure choices. In addition, this community is convenient to the Sarasota-Bradenton International Airport just west of U.S. 301. Several golf courses are also nearby including the Sara Bay Country Club, University Park Country Club and the Rolling Green Golf Club. Close to the Sarasota‒Manatee boundary, University Village is likewise convenient to some schools in the Manatee County School District. These include Kinnan Elementary, Sara Scott Harllee Middle, and Southeast High. This community, moreover, is well-positioned to reap benefits from recent initiatives to revitalize the U.S. 301 corridor and peripheral roads linking the Sarasota and Manatee. One area covered near University Village is the five-mile length of 26th Street West from Bradenton to Sarasota County, a strip with plenty of businesses and service providers like those at the Parkwood Professional Center. Below are the current real estate listings available at University Village.